The Great Sphinx of Giza is one of the most popular sites in the world. Constructed during the times of early Egypt, millions of people from all over the world have come to view this monument to innovation. The Great Sphinx is known for a number of things that make this structure unique. People visiting Egypt should definitely look into visiting Giza for a few hours just to take a tour around this great structure. There are a number of facts about the Great Sphinx of Giza has that many people are unaware. 1) The Great Sphinx of Giza is a gigantic structure that resides in the desert of Egypt. This immense structure depicts a huge creature that is a combination of both a lion as well as a man. The gigantic structure has a man’s head attached to a lion’s body. 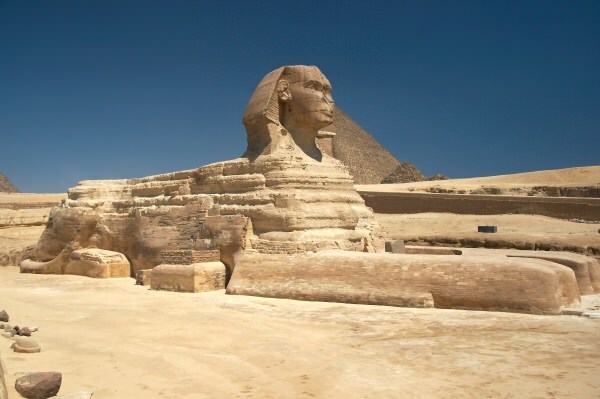 2) The Great Sphinx is a stone structure made from a complete slab of limestone. This limestone is over 200 feet long and more than 66 feet height. This immense structure can be seen from many miles away. The construction of this momentum is still in debate by scientist today. 3) Along with the sheer size and shape of this monument this structure sits in a unique plough of land. The Great Sphinx of Giza is located in a shallow depression that is located near a famous pyramid. The pyramid is also known as the “Pyramid of Pharaoh Khafre”. 4) According to samples collected from the Sphinx parts of it were made from different types of rock. The platform that the Sphinx is sitting on is made from a combination of both a softer limestone mixed with a heavier stone. 5) Some scientist believe that the stones used to construct the Sphinx were created from the base rock found in the masonry temples in the area. Many of these temples can be found to the north and the south of the Great Sphinx. 6) The Great Sphinx has suffered a lot of damage throughout the years. Some of the damage is due to time and the soft limestone deteriorating. However, the vast majority of the damage that was done to it was due to physical assault. The face has been completely broken and certain parts of the face seemed to be incredibly damaged. 7) According to some scholars and scientist the Great Sphinx at one time may have had a beard. Some of the pieces of the Sphinx’s beard were found in a British museum in the heart of London. Some of these pieces also went to the museum located in Cairo. 8) When most people think of the Great Sphinx they only assume that there is one structure. However, the Great Sphinx is a part of an entire group of structures in Egypt. Along with the Sphinx is the Great Temple and the Osirian Temple. 9) Many historians and geologists agree that Egypt experience many floods on a regular basis. This means that erosion from wind would not be possible, since this has been a recurring ever since then. 10) Scientist are still baffled at the purpose of the Great Sphinx of Giza. Some believe that this structure was built as a memorial to the Pharaohs. Others believe that the Great Sphinx acted as a guardian to keep unwanted ones out.